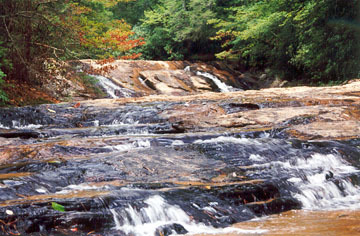 Cedar Creek cascades and sluices to form a dramatic wilderness scene. The pool is quite suitable for swimming on a hot summer day, but heavy rains turn the normally blue water to brown. 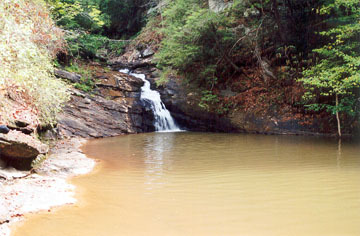 The 30-minute hike is fairly easy until you have to cross the creek in front of pretty Cedar Creek Falls and make your way downstream to the base of Blue Hole Falls. 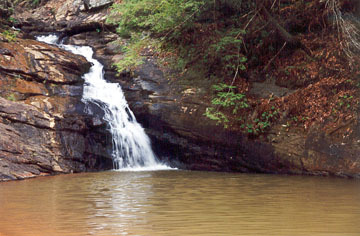 For safety reasons, avoid crossing the creek too far downstream at the top of Blue Hole's cascade. It's better to get your feet wet as you ford the creek than to slip and be dashed against the rocks near the base of Blue Hole. Once you are across, carefully make your way along the narrow path and pick your way down to the pool. Directions: From Walhalla, take SC 28 west for 6.5 miles to Whetstone Road (county road 193) (This road is less than a minute past the Stumphouse Mountain ranger station.). Turn left and drive .5 mile to Cassidy Bridge Road. Turn left and drive 1 mile to graveled Rich Mountain Road (Forest Service Road 744). Turn left and drive 3.5 miles to Cedar Creek Road (FS 744C). Turn right and drive 2.5 miles to FS 2658. Park on the right side and hike a quarter-mile down FS 2658 to a T-intersection with granite jeep barricades. Take the right fork and continue another quarter-mile. 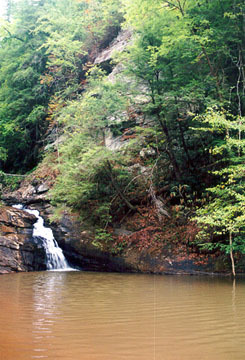 Before the road deadends at Cedar Creek, look for a short path down to the water below Cedar Creek Falls. 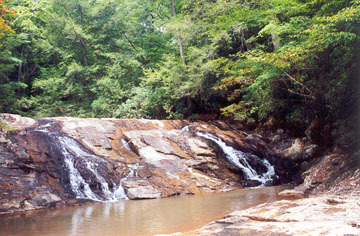 Cross the creek and make you way downstream to the base of Blue Hole Falls.